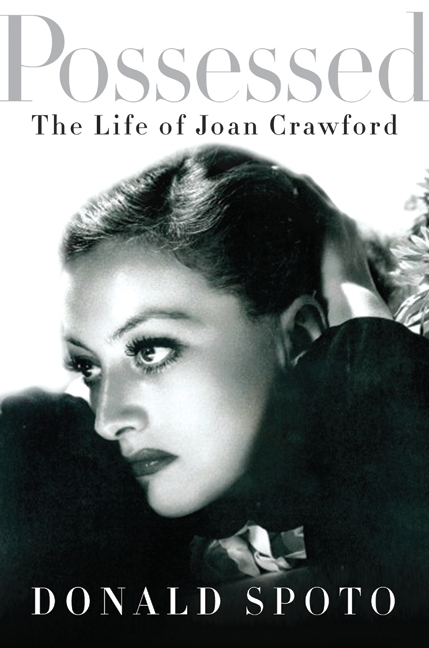 More than thirty years after her death, author Donald Spoto has released a new biography about Joan Crawford, named “Possessed“ (The book’s title is actually also the name of two unrelated Crawford movies, one from 1931 and one from 1947.). The author had been a fan of Crawford’s since seeing one of her movies as a child 60 years ago. (The movie? “Sudden Fear”!). My initial reactions upon news of a new Crawford bio were “Why wait so long to write a book about her? And why would this generation be interested in yet another book about Joan anyway? Wasn’t everything written about her already? !” Part of the reason for the new book is the authors’ quest to “clear” Joan’s name and reputation after “Mommie Dearest“– both the book and the movie. In fact, “Possessed” the book is quite a meaty read which succeeds on two levels. Spoto explores Joan’s personal life, where great highs existed alongside great lows. He opines at the book’s conclusion, “Her life had been a battle between the fantasy of movie stardom and the intrusion of reality– mostly in the form of failed marriages, disappointing love affairs, and the constant terror of losing her professional status.” Along the way, Spoto also talks about the star’s struggles with alcohol and ageism in Hollywood. As far as her professional life, Spoto makes very valid arguments about Joan’s contributions to cinematic history, spotlighting many of her films which can be seen with a new appreciation in 2011. He states, “With the passing of decades and the unfortunate image created by ’Mommie Dearest’, it became unfashionable to suggest that Joan Crawford was, in simple fact, one of the few truly great actresses in the history of American film.” But in case you’re wondering about “Mommie Dearest” anyway, we get to learn about that era of Joan’s life almost halfway through the book. That‘s when the author describes how, on the dawn of the 1940’s, Joan suffered an emotional crisis (Or, as the author calls it, an “interior crisis”) which Spoto hypothesizes was likely the manifestation of being childless. It was shortly afterward, he states, that Joan considered adopting children. Although he doesn’t hide his distaste for “Mommie Dearest” the book (Among almost eight pages of criticism of Christina Crawford’s best-seller, he states, “…’Mommie Dearest’ offered at the least an overstated, skewed image of its subject. At its worst, it was a vituperative act of revenge after Joan excised her two oldest children from her will after many years of discord.”), Spoto’s bio will no doubt help us to take a more balanced perspective on Joan‘s notoriously strong-willed persona. Put another way, Christina Crawford‘s story was only ONE side of the story. One of the criticisms of Christina’s book, incidentally, was that Joan’s OTHER two adopted children seem to had been almost entirely left out. Spoto makes a admirably attempt to include something about Joan’s younger children in his book. Film buffs will be motivated to track down some of Joan’s underappreciated movie gems (My favorites, incidentally, are “A Woman’s Face” from 1941 and “Queen Bee” from 1955. ), even the ones which Spoto personally disliked. (He says of the campy “Torch Song“ from 1953: “The result was simply one of the most dreadful motion pictures in history– it could have been the textbook guide for creating the ultimate drag show, except that ‘Torch Song‘ seemed to have neither wit nor purpose.”) There’s also one Crawford movie he writes about which surely NO ONE will get to see– “Great Day”, a MGM musical which was ultimately shelved. For a nice touch, Spoto’s book intersperses some biographical tidbits about many of Crawford’s peers throughout the years, including Greta Garbo, Constance Bennett, Norma Shearer, and her enduring friend William Haines, a rare case of a movie stair who was not only living as an openly gay man but also but living openly with his boyfriend back in the 1920‘s. It’s adds some interesting insight to the world that Crawford was living in. As much as the author would probably want you to forget “Mommie Dearest”, “Possessed” the book won’t do that. But it will no doubt makes us consider that any emotional instability depicted in Christina’s memoirs was only a small part of one woman’s complex and fascinating personality. Joan Crawford‘s story is also one of balancing one’s personal and professional lives. It‘s about surviving as a female actor in a male-dominated Hollywood and as a female in general in a male-dominated world. And it’s also a call for a new appreciation of her movies. Joan Crawford movie night, anyone?! Previous MR. EAGLE NYC 2011 SPEAKS: CB Kirby’s New Year’s Resolutions!